Europcar is a major player on the car rental scene in Europe (the company is based in France) although it has a lower profile than the big boys, Hertz and Avis Budget. Europcar joined Nectar last week as a new partner. Hertz and Nectar have gone their separate ways, it seems. 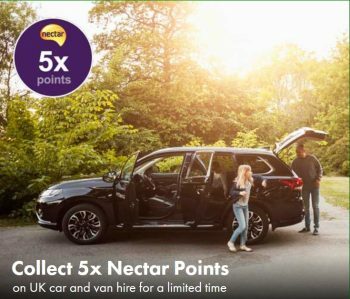 Full T&Cs and more information about the Nectar partnership can be found on the Europcar site here. It was possible to earn Avios from Europcar until a few years ago. It was a partner with Iberia Plus but Iberia followed British Airways into signing an exclusive deal with Avis. You can still earn Avios indirectly via Accor as I explain later. plus Air Europa, Eastern Airways, El Al, Finnair Plus, Flying Blue, Loganair and TAP Portugal. It also has a partnership with a major hotel group which can earn you hotel loyalty points (which you can turn into Avios). As you can see on the Accor website here, you can not only earn Accor points with Europcar but also redeem your points for vouchers to spend on Europcar bookings. This gets you the same value as redeeming for a hotel room, ie €40 per 2,000 points. As each Accor point is worth 2c or one Avios point (if you convert to Iberia Plus), you will receive at least €5 of value per rental. There is a special Accor / Europcar booking page which you can find here. Important: do not convert Accor points into Avios via British Airways Executive Club. For weird historical reasons, the rate into BA is 2:1 whilst the rate into Iberia is 1:1. There is a minimum transfer into Avios of 2,000 Accor points. Move to Iberia and then use ‘Combine My Avios’ to get them across to BA. Hilton cut back on its car rental partners this year. You can no longer earn Hilton Honors points when renting with Europcar. You can only credit rentals from Alamo, National and Enterprise. Europcar has its own loyalty scheme called Privilege. Full details can be found on the website here. The perks are modest but, importantly, you can double dip with earning frequent flyer miles or hotel points so there is no reason not to join up. Do 10 rentals over two years and you will be upgraded to Privilege Executive, triggering another free weekend voucher and an upgrade on every rental. 25 rentals over two years takes you to Privilege Elite, getting you a double upgrade. The lack of any partnership with Avios or Virgin Flying Club might mean that you give Europcar a miss given a choice. I can’t argue with that, and the poor earning rate from the new Nectar partnership doesn’t give you any extra incentive. If the price works or they are the most convenient company in any given situation, however, you should at least find an airline or hotel partner on this list that will ensure you earn a little something for your trouble. Slightly OT, but Hertz have also removed UK members’ access to ‘Hertz Hub’ – without notice. I tried National (Executive choice) for the first time (via Hertz PC status match) last week, and was most impressed. What is (was) hertz hub? It’s an invite-only forum for discussing all things Hertz. The administrator creates discussions, polls etc – and the idea is that the customer gives their feedback on said content. OT but nectar related – has anyone r curved the additional 10k nectar point for taking out the Nectar Amex last October? Got the standard card ok points but 10k remain elusive. Amex say that was a nectar promo, nectar first said it would 4 statement months, then I tried again who said there was no such promotion. I took out the Nectar card at about that time and was 30k points for 2k spend and the 20k of points from Nectar posted within days of hitting the target. What about your remaining 10k points? Online chat with Nectar (no e-mail available) said the remaining 10k points will be posted 4 weeks from 8.1.18. Qualifying spend completed 28.12.17. Hasn’t hertz just joined SPG? IME, Europcar is by a long stretch the worst of the UK majors when it comes to service. Crawling over the car on return with some kind of specialist torch looking for damage then trying to charge me for a missing parcel shelf in an estate (which wasn’t there when I picked it up) really has me done with the company now. I will however happily wave the flag for the Thrifty who have great UK coverage, were a bargain on a one way rental and quite cheap to boot. Look up my article on Europcar’s £1 one way rentals. Booked a 1 way for £1 Europcar rental 2 weeks ago. Expected something like a Fiat 500, ended up in a Boxster. Only Europcar rental I have done was a £1 offer. We had a problem finding someone to check the car in at the end, but the actual check was extremely cursory (and we were about 90 mins late in too). Just read a post of yours regarding Beijing and the New World hotel you stayed at. We are staying there in March, with Residence Club and would love more information on what to expect in the lounge and when during the day. How much western food was there for breakfast and at cocktail hour? You also mentioned the Great Wall – did you do a tour or get there under your own steam? Would welcome any suggestions. I’m away currently but will try and dig out some info for you when home this evening. We did a tour of the great wall that we’d recommend from Chinahighlights – was 4 hours on the wall plus lunch and return transport from our hotel in a minivan. We booked the “small group tour with guide” so us 2 plus 4 strangers (whole group and guide were English speaking). The bit we went to was completely deserted first thing in the morning so got a really good view and experience. It was ~$120 each in 2016. Only downside was the very early start in an attempt to (unsuccessfully) beat traffic – made worse as we were on the west side of the city at the Shangri-La so first pick and last drop off, so nearly a 12 hour day, half in traffic. But still worth it. Thanks both, will look into both your suggestions! Isn’t there a limit to how many payments HMRC will accept over a period of time? No, there is a limit to the number of different cards you can use. The way they write it is vague, I admit, but this is what they mean. Yes. I paid my self-assessment over 30 transactions this month. Curve is fine BUT their security is very tight. Use the card and your limit gets increased which is why I could do £1750 in one go with no issues. Europcar has always been my rental go to due to the fact that it’s the cheapest by far. I also have accorhotel ibis business it comes with europcar 20% discount. The cheapest one I always find in London is the Heathrow branch. Never have any issues with that branch, even with a slight scratch, they didn’t care. If you are worried of any charges, I’m always happy for them to charge my BAPP card, get me more points, and expense against one of those Car Hire Excess insurance I got (£40 a year). Does anyone know if you can get the nectar points on corporate bookings that arent direclty with Europcar but cars are provided by Europcar? Would showing my nectar card on collection suffice? Never hurts to ask but I am guessing not.